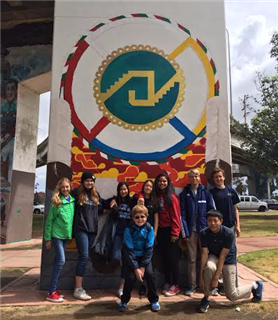 On May 6th, the 8th-grade class split up for an afternoon of cultural discovery at Chicano Park and language immersion in Tijuana. At Chicano Park, students learned how peaceful protest led to the park's establishment in the 1970's, and how it became one of the largest assemblages of public murals in North America. The group also created reflective projects that included photography, creative writing, sketching, poetry, Spanish-English translations, and STEAM-based interpretations of the park's art and history. In Tijuana, the group toured a local Adult School and heard the personal stories of the school's students and teachers. At lunch, many students enjoyed local dishes including mole, horchata and jamaica, for the first time. Then, during the wait to cross the border back into the United States, students studying Spanish had the opportunity to put a recent unit on "market" vocabulary into use while negotiating with vendors.